On June 17, 2016, Col. Timothy Kopra turned over command of the International Space Station (ISS) to Col. Jeff Williams as Expedition 47 ended and 48 began. After completing 186 days in space, Expedition 47 crew members returned home. NASA astronaut Col. Williams and cosmonauts Oleg Skripochka and Alexey Ovchinin continued station operations, with three new crew members scheduled to join them in early July. Col. Williams is allowed periodic face-time with family and friends. During the transition time, he graciously offered a videoconference to the Institute for Creation Research staff while his wife, Anna-Marie, listened in from Houston. His responses gave us a unique look into his heart. ICR’s Chas Morse acted as host for the 30-minute interchange, and Dr. Henry Morris III kicked things off by reminding Col. Williams that the ICR family continually prays for him and his crew. Dr. Jason Lisle then asked Col. Williams if there is any experiment he finds particularly interesting. He responded that the most intriguing are the studies on the effects of radiation and weightlessness on the human body. Earth’s environment has to be duplicated in the ISS, which gives Col. Williams a great appreciation for God’s handiwork—especially since human attempts to replicate it have been imperfect. Eric Bowyer asked, “What has God taught you while you’ve been in space?” Col. Williams said he has a deeper admiration for God’s providence. He sees how God has worked throughout his life, eventually preparing him to be where he is now as an astronaut. He also sees God’s providence in the little things. Particularly special is the provision He has given Col. Williams and Anna-Marie to endure their time apart, not once, but during three long space flights. Science writer Brian Thomas asked Col. Williams how we can be praying for him. His requests were threefold: 1) continued provision for him and his crew to execute the mission safely and effectively, 2) for peace and safety for his family back on Earth, and 3) that he and all of us at ICR would diligently remain within our God-given purposes in life. Col. Williams reminded our staff that each of us is called to a purpose, and we are to do our best to fulfill it before the Lord. The purpose is not just for ourselves—it’s bigger than that—and his prayer is that we would all be faithful to our calling. When asked about the most beautiful thing he’s seen from space, Col. Williams replied that sunrises and sunsets are at the top of the list. He has taken hundreds of thousands of pictures from space of the wonders of God’s Earth, some of which he shares in his book, The Work of His Hands (available at ICR.org/store). Dr. Jake Hebert wrapped the time up by thanking Col. Williams for his bold Christian witness. What a blessing to see the witness of God’s people—whether orbiting the earth or with feet firmly planted on the ground. * Mr. Stamp is an editor at the Institute for Creation Research. Cite this article: Michael Stamp. 2016. 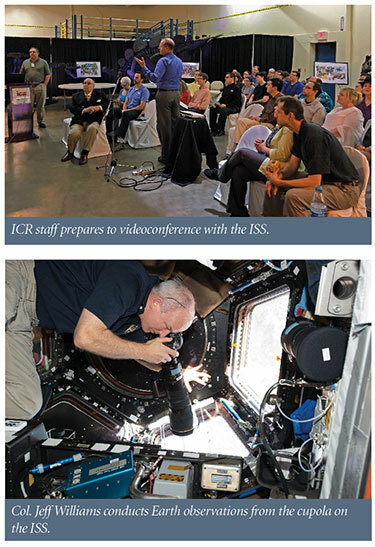 Providence, Provision, and Purpose: Videoconference with ISS Commander. Acts & Facts. 45 (8).